We present a novel method of manufacturing rigid and robust short natural fiber preforms using a papermaking process. Bacterial cellulose acts simultaneously as the binder for the loose fibers and provides rigidity to the fiber preforms. These preforms can be infused with a resin to produce truly green hierarchical composites. Lee, K. Y., Shamsuddin, S. R., Fortea-Verdejo, M., Bismarck, A. Manufacturing Of Robust Natural Fiber Preforms Utilizing Bacterial Cellulose as Binder. J. Vis. Exp. (87), e51432, doi:10.3791/51432 (2014). A novel method of manufacturing rigid and robust natural fiber preforms is presented here. This method is based on a papermaking process, whereby loose and short sisal fibers are dispersed into a water suspension containing bacterial cellulose. The fiber and nanocellulose suspension is then filtered (using vacuum or gravity) and the wet filter cake pressed to squeeze out any excess water, followed by a drying step. This will result in the hornification of the bacterial cellulose network, holding the loose natural fibers together. Our method is specially suited for the manufacturing of rigid and robust preforms of hydrophilic fibers. The porous and hydrophilic nature of such fibers results in significant water uptake, drawing in the bacterial cellulose dispersed in the suspension. The bacterial cellulose will then be filtered against the surface of these fibers, forming a bacterial cellulose coating. When the loose fiber-bacterial cellulose suspension is filtered and dried, the adjacent bacterial cellulose forms a network and hornified to hold the otherwise loose fibers together. The introduction of bacterial cellulose into the preform resulted in a significant increase of the mechanical properties of the fiber preforms. This can be attributed to the high stiffness and strength of the bacterial cellulose network. With this preform, renewable high performance hierarchical composites can also be manufactured by using conventional composite production methods, such as resin film infusion (RFI) or resin transfer molding (RTM). Here, we also describe the manufacturing of renewable hierarchical composites using double bag vacuum assisted resin infusion. Steadily increasing oil prices and the public's growing demand for a sustainable future have sparked and revived the research and development of green materials, especially polymers and composites. Unfortunately, the thermo-mechanical performance of green or renewable polymers is often inferior compared to traditional petroleum based polymers1. For instance, commercially available polylactide (PLA) and polyhydroxybutyrate (PHB) are brittle and possess low heat distortion temperatures. One solution of creating renewable materials that match or even exceed the performance of commonly used petroleum-based engineering materials is to learn from the past; Henry Ford used a composite strategy, i.e. combining bio-based/renewable polymers with a reinforcement2, to enhance the properties of renewable polymers. It is often claimed that natural fibers serve as ideal candidate as reinforcement because of their low cost, low density, renewability and biodegradability3. 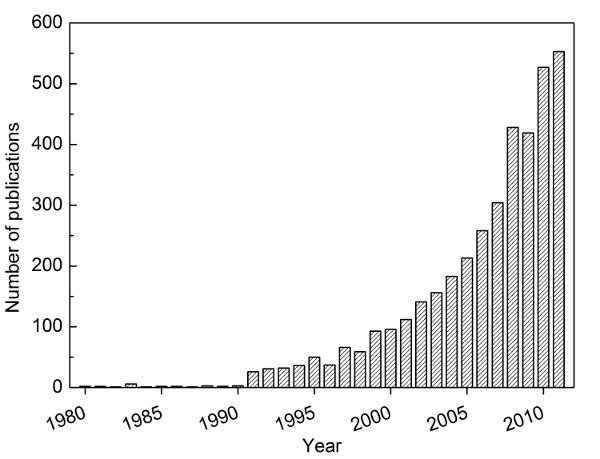 Natural fiber composites have seen a renaissance in the 1990's as can be seen by the exponential increase in the number of peer-reviewed scientific publications (Figure 1)4. However, the hydrophilic nature of natural fibers and hydrophobic characteristics of most thermoplastics are often blamed to result in poor fiber-matrix adhesion5, which often results in poor mechanical performance of the resulting fiber-reinforced polymer composites. To solve this challenge, numerous researchers attempted to chemically modify the surfaces of natural fibers6,7. These chemical modifications include acetylation8, silylation9, polymer grafting10, isocyanate treatments11,12, use of maleated coupling agents13-17, and benzoylation18. Even though these chemical treatments have rendered natural fibers more hydrophobic, the resulting natural fiber-reinforced polymers still failed to deliver in terms of mechanical performance19. Thomason20 hypothesized that this failure could be a result of the anisotropicity and the high linear thermal coefficient of expansion of natural fibers. In addition to this, natural fibers also suffer from drawbacks such as limited processing temperature21, batch-to-batch variability3, low tensile strength compared to synthetic fibers, such as glass, aramid or carbon fibers and the lack of suitable manufacturing processes to produce natural fibers reinforced polymer composites. Thus, using natural fibers as reinforcement will not be sufficient to close the aforementioned property-performance gap between green materials and petroleum-based polymers. Nanocellulose is an emerging green reinforcing agent. In particular, nanocellulose produced by bacteria, such as from the Acetobacter species22, also known as bacterial cellulose serves as an interesting alternative for the design of green materials23 due to the possibility of exploiting the high stiffness and strength of cellulose crystals24. The stiffness of a single cellulose crystal was estimated to be approximately 100-160 GPa using X-ray diffraction, Raman spectroscopy and numerical simulations25-27. This is higher than glass fibers ~70 GPa, which are however much denser. Bacterial cellulose (BC) is also inherently nano-sized with a diameter of approximately 50 nm and several micrometers in length28. We reported a method to coat natural (sisal and hemp) fibers with layers of BC by culturing Acetobacter xylinius in the presence of natural fibers5,29,30. This led to improved interfacial adhesion between PLLA and BC-coated natural fibers29,31. In order to simplify the process of coating these fibers, Lee et al.31 developed a method of coating natural (sisal) fibers without the use of bioreactors. This method is based slurry dipping process, whereby dry sisal fibers are immersed into a BC suspension. An extension of this method32 is to filter the water suspension containing loose sisal fibers and BC to produce sisal fiber preforms suitable for typical composite structures manufacturing. Determine the wet-to-dry mass of BC by measuring the wet mass of BC, followed by vacuum drying of wet BC at 80 °C overnight (O/N). Once dried, measure the dry mass of BC. Measure the amount of wet BC pellicle equivalent to 18 g of dry BC from the pre-determined wet-to-dry mass of BC. Cut the wet BC pellicles into small pieces of ~1-2 cm using a pair of sharp scissors. After cutting, soak the BC pellicles in 1 L of water to allow for the hydration of cut pellicles. Feed the cut BC pellicle into a blender and add an appropriate amount of water into the blender such that the blending process will go smoothly. Blend these BC pellicles for 2 min. Pour the blended BC into a 15 L container and add water until the total water volume is 14 L, making up a BC concentration in water of 0.1 (g/ml)% (percentage mass of bacterial cellulose per unit volume of water). The BC pellicles might need to be fed into the blender in batches for blending. Cut 72 g of loose sisal fibers (or any source of short natural fibers) into 1-2 cm long fibers and add them into the BC suspension. Gently stir the suspension to ensure a homogenous dispersion of sisal fibers in the BC suspension. Soak the sisal fibers in this suspension O/N. Open sheet mold and close the drainage valve. Fill the system with DI water until the water level reaches the backing wire. Place a 100 mesh metal forming wire on the backing wire, centered within the sheet mold base. Close and latch the sheet mold. Add additional fresh water until the forming wire is submerged in water. Pour the prepared sisal fiber-BC suspension into the sheet mold. Gently stirring the suspension to ensure that the sisal fibers are homogenously distributed throughout the mold. Open the drain valve to drain the water, which will result in the formation of a wet filter cake of sisal fibers and BC on the forming wire. Immediately after the water drains, open the sheet mold and remove the forming wire. Place the forming wire on a piece of blotting paper. Additional blotting papers are placed on the top of the filter cake, followed by a metal plate. Flip the filter cake around. With the forming wire now facing the top, remove the forming wire and place additional blotting paper directly on top of the filter cake, followed by a metal plate. Place a 10 kg weight on top of the metal plate to press the water out. When the blotting paper is fully soaked, replace the blotting papers with fresh blotting papers and press the filter cake again using a weight of 10 kg. Replace the blotting papers 1 final time and perform a final pressing of 1 ton in a hot press to consolidate the fiber preform. Heat the hot press up to 120 °C to aid the evaporation of residual water. This should take approximately 4 hr. Reduce the temperature of the hot press to room temperature (RT) and allow the preform to cool down prior to removal from the hot press. Cut a 2 × 2 cm2 BC-sisal fiber preform. Stick this cut preform onto SEM stub using carbon tabs. Coat the sample in a Cr sputter coater operating at 75 mA for 1 min. Image the BC-sisal fiber preform with field emission gun SEM in in-lens mode using a beam energy of 5 kV. Note: Do not try to image the sisal-fiber preform without gluing the preform onto the SEM stub using conductive adhesive. The loose fibers will be sucked away during the evacuation of the SEM chamber and damage the electron gun. Place the preform on top of the tooling side, which consists of a non-porous PTFE coated glass release fabric. Cover the preform with a porous PTFE coated glass release fabric, also known as a peel ply, followed by a porous flow medium. Both the peel ply and the flow medium should be larger that the preform (see Figure 2 for a process schematic). Position the omega tubes at the intended resin inlet and outlet of the VARI set up. Ensure that the omega tubes are placed on top of the porous flow medium to allow the resin to distribute into the VARI set up during infusion. The length of omega tubes should be as wide as the flow medium. Place pressure sensitive tapes around the periphery of the set up. Ensure that the paper backing of the pressure sensitive tapes is still left on the tapes at this point. Insert the resin feed and outlet tubes into the openings of the omega tubes and cover the set up with a fluoroethylene polymer based bagging film and seal it using pressure sensitive tapes. Seal the resin feed tube. Position the other end of the resin outlet tube on top of the breather cloth. Place a metal plate on top of the inner bag where the fiber preform is, followed by a piece of breather cloth. The metal plate should be the size of the preform. Identify the position where the through bag vacuum valve should be and place the bottom piece of the valve on top of the breather cloth. Place the vacuum sealant tape around the internal bag and place a vacuum bagging film on top of it and seal it. The excess vacuum bagging film will form pleats. Place the sealant tape inside the pleat to complete the seal. Cut a small 'x' on the vacuum bagging film where the bottom piece of the valve is and screw in the top piece to complete the through bag vacuum valve. It is important to avoid wrinkling of the vacuum bagging film under the top piece as this could cause a leak path. Connect the quick connect fitting and pull a vacuum. During this process, the vacuum bagging film can be moved around and place where excess is needed. Check for vacuum leaks. Prepare the resin by mixing the epoxy and hardener at a weight ratio of 100 to 19. Degas the resin at a reduced pressure to remove all the air bubbles trapped during the mixing of the epoxy resin and hardener. Once the VARI set up is determined to be leakage-free, feed the resin via the tubing connected to the omega tube. Ensure that the resin is fed slowly such that it has time to impregnate into the fiber preform. Allow the resin to flow out from the resin outlet tube and soak into the breather cloth until no air bubbles can be observed coming out from the outlet tube. Seal the outlet tube and allow the resin to cure for 24 hr at RT, followed by a post-curing step at 50 °C for 16 hr. Note: (1) The curing cycle is resin dependent. (2) It is very important that maximum vacuum is achieved within the VARI set up and there is no vacuum leak within set up. A poor VARI set up (not achieving maximum vacuum or a leak) will result in pores within the manufactured composites and significantly reduced fiber volume fraction within the composites. (3) The epoxy-to-hardener ratio is resin dependent. Please check the product datasheet of the resin for the epoxy-to-hardener ratio prior to mixing. Without a BC binder, the short, loose sisal fibers are held together only by friction and entanglements between the fibers. As a result, this preform is loose and it was not able to support much weight. Figure 3 shows the sisal fiber preform without BC as the binder, with a load applied in 3-point bending mode. The preform can be seen to be rather loose and when a load is applied by adding water into the polypropylene cup, the preform starts to deflect severely. The load applied is equivalent to 40 g of water. However, when 20 wt.% BC was used as the binder for these short and loose sisal fibers, a rigid fiber preform is manufactured. This preform can withstand the load of a full polypropylene cup (~170 g) without any significant deflection (Figure 3). Scanning electron micrographs of a typical BC-sisal fiber preform are shown in Figure 4. BC can be seen to be covering the surface of the sisal fibers. This effect is due to the hydrophilic nature of sisal fibers (or any other natural fibers). The hydrophilic nature of sisal fibers absorbs water, drawing in the BC that is dispersed in the medium. Since BC is larger than the pores of natural fibers, they were not able to penetrate into the fibers. Instead, they were filtered against the surface of sisal fibers and form a layer of BC coating when the fibers were dried. The mechanical performance of these fiber preforms under tension is tabulated in Table 1. Due to the porous nature of the fiber preforms with a porosity of ~70%, the tensile strength (load per unit area) of the preform is not well defined. Therefore, we tabulate the tensile force (load required to fail the specimen per unit width, which is 15 mm in our experiment, of the material) and the tensile index (tensile force per unit grammage) of our specimen. A tensile force and tensile index of 12.1 kN·m-1 and 15 N·m·g-1 was measured, respectively, when 20 wt.% BC was used as the binder. However, the tensile properties of neat sisal fiber preforms were not measurable as the fiber preform is loose. Figure 1. Number of publications in the field of natural fibers and composites. The data was collected from the Web of Knowledge by using a keyword search of 'natural fib*' AND 'composite*', respectively. Obtained from Bismarck et al.4 with kind permission from American Scientific Publishing Ltd. Figure 2. Schematic of double bag vacuum assisted resin infusion. Figure 3. 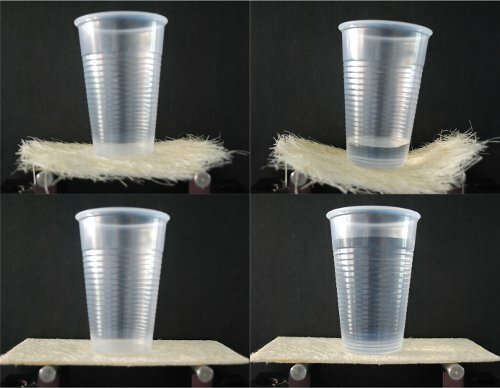 Photographs illustrating the difference in bending stiffness of sisal fiber preforms without (top two images) and with (bottom two images) BC as binder. Figure 4. Scanning electron micrographs of a typical natural fiber preform using BC as binder at various magnifications. Top: 100X, middle: 1,000X and bottom: 25,000X, respectively. (a) and (b) denote the sisal fiber and BC nanofibrils, respectively. Table 1. Tensile properties of the sisal fiber preforms, with and without BC as the binder. We have shown in this experiment that loose sisal fibers can be bound with BC. However, the choice of fibers is not limited to just sisal fibers. Other types of fibers, such as flax and hemp, can also be used. In addition to this, we have also shown that wood flour, recycled paper, and dissolving pulp can also be bound into rigid and robust preforms using a BC binder (results not published yet). The criterion is that the fibers used should be hydrophilic and absorb water. As aforementioned, the hydrophilic nature of the fibers will absorb water, drawing in the BC that is dispersed in the medium. The BC is filtered against the surface of these hydrophilic fibers and forms a layer of BC coating when the fibers were dried. Whilst bacterial cellulose can be deposited around natural fibers by culturing Acetobacter xylinus in the presence of natural fibers5,29,30, this process is laborious and requires expensive bioreactors with tight control of pH and dissolved oxygen content. Our improved process, on the other hand, is based on a papermaking method (i.e. : dispersing natural fibers in a BC suspension) and there is no need for bioreactors31. With regards to the application of natural fibers in composites, randomly oriented non-woven (short and randomly oriented) natural fiber preforms are produced by needle punching (essentially stitching) polymer fibers (typically a polyester) through loose compacted fibers33. To make a composite, the fiber preforms are then placed in a mold and infused with a resin. Polymers fibers can also be commingled with natural fibers34 (typically flax, hemp, or jute) or dispersed in a natural fiber suspension and vacuum filtered35 at high polymer volume fraction (50 vol.%). This polymer fiber-natural fiber mat (preform) is then subsequently heated to melt the polymer to produce a composite structure. The latter processes of producing composites are intrinsically scalable but are limited by the choice of polymer fibers (the polymer should melt at temperatures lower than the degradation temperature of the fibers) that can be used to make preforms and, therefore, the type of matrices available to make composites. Using our method, BC does not only act as a binder, it also acts as a nano-reinforcement32. As aforementioned, the Young's modulus of an individual BC nanofiber was estimated to be 114 GPa. Whilst the single fiber tensile strength of BC is not known, the tensile strength of single TEMPO-oxidized wood and tunicate fibers has been recently measured using ultrasonic induced cavitation36. A tensile strength of between 0.8-1.5 GPa was measured for these single nanofibers. These mechanical properties, along with the binding potential of BC, made BC an excellent candidate to produce truly green and randomly oriented short natural fiber-reinforced, bacterial cellulose-reinforced renewable composites with mechanical performance that exceeds conventional fiber-reinforced polymers. In term of composite manufacturing, our preferred manufacturing process is the discussed double bag vacuum assisted resin infusion (DBVI) developed by Waldrop et al.37 Unlike the more conventional single bag vacuum assisted resin infusion (also known as the Seemann process38), DBVI employs two independent vacuum bags during the infusion process (see Figure 2). Whilst the Seemann process will work for manufacturing composites, this process might suffer from vacuum bag relaxation behind the flow front of the resin. When this occurs, the area where relaxation occurs will feel soft and spongy. The vacuum bag relaxation will result in the vacuum bag moving away from the flow medium due to the preferential flow of liquid resin in the path of least resistance. This will cause the manufactured composites to have non-uniform fiber volume fractions (i.e. the relaxed area will have a lower fiber volume fraction than the non-relaxed area of the vacuum bag). DBVI does not suffer from this drawback, as the inner vacuum bag never relaxes behind the flow front of the liquid resin. As a result, the resulting composite panels will have higher than average fiber volume fraction and more uniform thickness. Moreover, the use of the outer vacuum bag provides a redundancy to the system and improves the vacuum integrity of the liquid infusion process. The authors would like to thank the University of Vienna for supporting KYL and the UK Engineering and Physical Science Research Council (EPSRC) for a Follow-on Fund for funding SRS and the work (EP/J013390/1). Formax standard sheet mould Adirondack Machine Corporation This piece of equipment could be replaced with a Büchner funnel. Blaker, J. J., Lee, K. Y., Bismarck, A. Hierarchical composites made entirely from renewable resources. J. Biobased Mater. Bioenergy. 5, 1-16 (2011). Shurteff, W., Aoyagi, A. Henry Ford and his researchers - History of their work with soybeans, soyfoods and chemurgy (1928-2011): Extensively annotated bibliography and sourcebook. Soyinfo. (1928-2011), Soyinfo Center. (2011). Bismarck, A., Mishra, S., Lampke, T. Ch. 2, Plant Fibers as Reinforcement for Green Composites. Natural Fibers, Biopolymers and Biocomposites. Mohanty, A. K., Misra, M., Drzal, L. T. CRC Press. 37-108 (2005). Bismarck, A., et al. Recent Progress in Natural Fibre Composites: Selected Papers from the 3rd International Conference on Innovative Natural Fibre Composites for Industrial Applications, Ecocomp 2011 and BEPS 2011. J. Biobased Mater. Bioenergy. 6, 343-345 (2012). Pommet, M., et al. Surface modification of natural fibers using bacteria: Depositing bacterial cellulose onto natural fibers to create hierarchical fiber reinforced nanocomposites. Biomacromolecules. 9, 1643-1651 (2008). Lee, K. -Y., Delille, A., Bismarck, A. Ch. 6, Greener Surface Treatments of Natural Fibres for the Production of Renewable Composite Materials. Cellulose Fibers: Bio- and Nano-Polymer Composites. Kalia, S., Kaith, B. S., Kaur, I. Springer-Verlag. 155-178 (2011). Kalia, S., Kaith, B. S., Kaur, I. Pretreatments of Natural Fibers and their Application as Reinforcing Material in Polymer Composites-A Review. Polym. Eng. Sci. 49, 1253-1272 (2009). Bledzki, A. K., Gassan, J. Composites reinforced with cellulose based fibres. Prog. Polym. Sci. 24, 221-274 (1999). Gousse, C., Chanzy, H., Cerrada, M. L., Fleury, E. Surface silylation of cellulose microfibrils: preparation and rheological properties. Polymer. 45, 1569-1575 (2004). Siro, I., Plackett, D. Microfibrillated cellulose and new nanocomposite materials: a review. Cellulose. 17, 459-494 (2010). Joseph, K., Thomas, S., Pavithran, C. Effect of chemical treatment on the tensile properties of short sisal fibre-reinforced polyethylene composites. Polymer. 37, 5139-5149 (1996). Siqueira, G., Bras, J., Dufresne, A. New Process of Chemical Grafting of Cellulose Nanoparticles with a Long Chain Isocyanate. Langmuir. 26, 402-411 (2010). Arbelaiz, A., et al. Mechanical properties of short flax fibre bundle/polypropylene composites: Influence of matrix/fibre modification, fibre content, water uptake and recycling. Composites Science and Technology. 65, 1582-1592 (2005). Gassan, J., Bledzki, A. K. The influence of fiber-surface treatment on the mechanical properties of jute-polypropylene composites. Compos. Pt. A-Appl. Sci. Manuf. 28, 1001-1005 (1997). Gauthier, R., Joly, C., Coupas, A. C., Gauthier, H., Escoubes, M. Interfaces in polyolefin/cellulosic fiber composites: Chemical coupling, morphology, correlation with adhesion and aging in moisture. Polym. Compos. 19, 287-300 (1998). George, J., Sreekala, M. S., Thomas, S. A review on interface modification and characterization of natural fiber reinforced plastic composites. Polym. Eng. Sci. 41, 1471-1485 (2001). Hornsby, P. R., Hinrichsen, E., Tarverdi, K. Preparation and properties of polypropylene composites reinforced with wheat and flax straw fibres. 2. Analysis of composite microstructure and mechanical properties. Journal of Materials Science. 32, 1009-1015 (1997). Joseph, P. V., Joseph, K., Thomas, S. Short sisal fiber reinforced polypropylene composites: the role of interface modification on ultimate properties. Compos. Interfaces. 9, 171-205 (2002). Thomason, J. L. Why are natural fibres failing to deliver on composite performance. Conference Proceedings of the 17th International Conference of Composite Materials. Edinburgh, United Kingdom. (2009). Thomason, J. L. Dependence of Interfacial Strength on the Anisotropic Fiber Properties of Jute Reinforced Composites. Polym. Compos. 31, 1525-1534 (2010). Wielage, B., Lampke, T., Marx, G., Nestler, K., Starke, D. Thermogravimetric and differential scanning calorimetric analysis of natural fibres and polypropylene. Thermochim. Acta. 337, 169-177 (1999). Brown, A. J. The chemical action of pure cultivations of bacterium aceti. Journal of the Chemical Society, Transations. 49, 172-187 (1886). Lee, K. -Y., Buldum, G., Mantalaris, A., Bismarck, A. More Than Meets the Eye in Bacterial Cellulose Biosynthesis, Bioprocessing, and Applications in Advanced Fiber Composites. Macromol. Biosci. 14, 10-32 (2014). Eichhorn, S. J., et al. Review: current international research into cellulose nanofibres and nanocomposites. Journal of Materials Science. 45, 1-33 (2010). Eichhorn, S. J., Davies, G. R. Modelling the crystalline deformation of native and regenerated cellulose. Cellulose. 13, 291-307 (2006). Matsuo, M., Sawatari, C., Iwai, Y., Ozaki, F. Effect of Orientation Distribution and Crystallinity on the Measurement by X-Ray-Diffraction of the Crystal-Lattice Moduli of Cellulose-I and Cellulose-II. Macromolecules. 23, 3266-3275 (1990). Hsieh, Y. C., Yano, H., Nogi, M., Eichhorn, S. J. An estimation of the Young's modulus of bacterial cellulose filaments. Cellulose. 15, 507-513 (2008). Lee, K. -Y., et al. Surface only modification of bacterial cellulose nanofibres with organic acids. Cellulose. 18, 595-605 (2011). Juntaro, J., et al. Creating hierarchical structures in renewable composites by attaching bacterial cellulose onto sisal fibers. Adv. Mater. 20, 3122-3126 (2008). Juntaro, J., Pommet, M., Mantalaris, A., Shaffer, M., Bismarck, A. Nanocellulose enhanced interfaces in truly green unidirectional fibre reinforced composites. Compos. Interfaces. 14, 753-762 (2007). Lee, K. -Y., Bharadia, P., Blaker, J. J., Bismarck, A. Short sisal fibre reinforced bacterial cellulose polylactide nanocomposites using hairy sisal fibres as reinforcement. Composites Part A-Applied Sciencce and Manufacturing. 43, 2065-2074 (2012). Lee, K. -Y., Ho, K. K. C., Schlufter, K., Bismarck, A. Hierarchical composites reinforced with robust short sisal fibre preforms utilising bacterial cellulose as binder. Composites Science and Technology. 72, 1479-1486 (2012). Cincik, E., Koc, E. An analysis on air permeability of polyester/viscose blended needle-punched nonwovens. Textile Research Journal. 82, 430-442 (2012). Zhang, L., Miao, M. Commingled natural fibre/polypropylene wrap spun yarns for structured thermoplastic composites. Composites Science and Technology. 70, 130-135 (2010). Garkhail, S. K., Heijenrath, R. W. H., Peijs, T. Mechanical properties of natural-fibre-mat-reinforced thermoplastics based on flax fibres and polypropylene. Applied Composite Materials. 7, 351-372 (2000). Saito, T., Kuramae, R., Wohlert, J., Berglund, L. A., Isogai, A. An Ultrastrong Nanofibrillar Biomaterial: The Strength of Single Cellulose Nanofibrils Revealed via Sonication-Induced Fragmentation. Biomacromolecules. 14, 248-253 (2013). Impregnating a fibrous reinforcing substrate with a resin, by using a vacuum and differential pressure in a dual chambered system. US patent. Waldrop, J. C., et al. US7413694-B2; US2012231107-A1; US2008220112-A1; US8356989-B2 (2001). Vacuum assisted moulding of fibre reinforced plastic structures|in which even distribution of resin is ensured by removable medium having upwardly facing openings and connecting lateral passages. US patent. Seemann, W. H. US4902215-A (1989).